Sebastiano Pasquale "Patsy" Gulino, 74, of Wethersfield, loving husband of Sebastiana (Amenta) Gulino for 48 years, died Thursday, (June 23, 2011) at Hartford Hospital with his devoted family by his bedside. He was born June 12, 1937 in Canicattini Bagni province of Siracusa, Sicily and was the son of the late Salvatore and Lucia (Cavaliere) Gulino. He worked as a Mason prior to owning and operating the former Buon Appetito Restaurant and the Skywalk Restaurant, as well as several other restaurants in the greater Hartford area for 27 years, retiring several years ago. 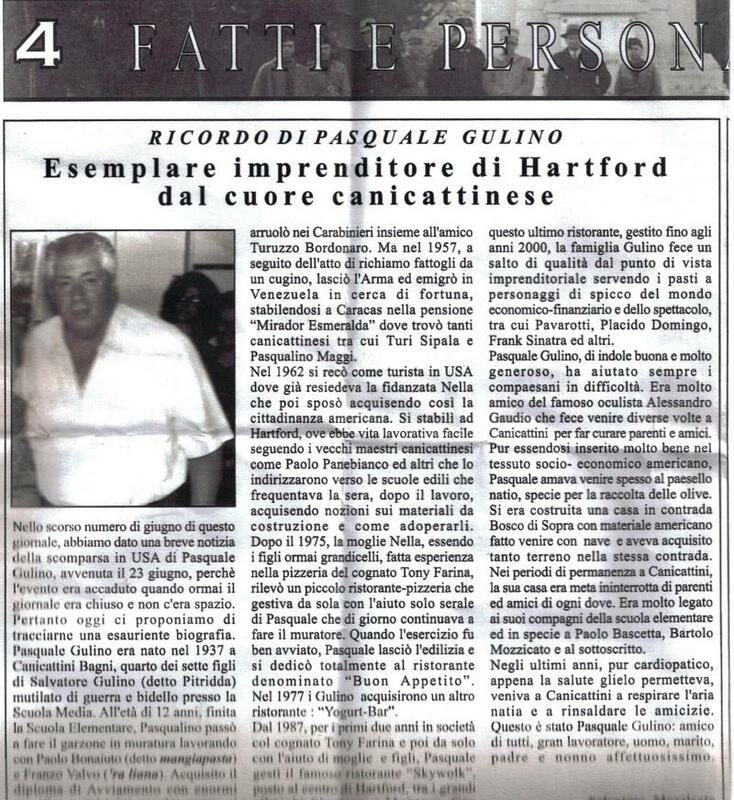 Patsy had a passion for gardening on his farm in Sicily. He and his wife, spent many summers and have many good memories of their beloved farm. His zest for life, doing things his way, his generosity and kindness towards others will always be remembered. He was a lifelong member of the Italian American Stars and the Canicattinese Society. He will be sadly missed by his family and many friends. Besides his wife, he is survived by his daughter, Lucia of Torrington, his son, Paul and wife, Pina of Wethersfield; his cherished grandchildren, Sebastiano, Alessandro and Gabriella; a brother, Santo Gulino, and sister, Concettina Gulino both of Sicily; his brother-in-law and sister-in-law, Tony and Tina Farina of Wethersfield; several nieces and nephews; and his best friend, who was more like a brother to him, Dr. Alex Gaudio and family. A very special thank you to the doctors, nurses and staff at Hartford Hospital for the love, care and compassion shown to Patsy and his family. Funeral service will be Monday at 9 a.m. at the D'Esopo Funeral Chapel, 277 Folly Brook Blvd. Wethersfield followed by a Mass of Christian Burial at 10 a.m. at St. Luke Church, 66 Bolton Street, Hartford. The burial will be in Cedar Hill Cemetery, Hartford Calling hours are Sunday from 4-7 p.m. at the funeral chapel. Lucia M. Gulino, 48, of Wethersfield, daughter of Sebastiana (Amenta) Gulino of Wethersfield and the late Sebastiano "Pasquale" Gulino, passed away peacefully on Saturday (June 2, 2012) at Hartford Hospital, surrounded by her loving and devoted family. She was born in Hartford on December 29, 1963. Lucia graduated from Bulkeley High School (1981), Rhode Island School of Photography (1983), followed by a B.A. from the University of Hartford (HARTT School). She next attended the Watershed School in Maine, where she perfected her pottery and obtained her Master of Arts from the prestigious Cranbrook Academy of Art. Lucia became an art professor at the University of Hartford, with later teaching assignments at Trinity College, Wesleyan Potters, Farmington Art Guild and the Metropolitan Learning Center (MLC) magnet school. The last six years of her career were at Sharon Center School in Sharon. Besides her mother, she is survived by her brother, Paolo Gulino and his wife Pina of Wethersfield, loving niece and goddaughter Gabriella and adored nephews Seby and Alex. Lucia is also survived by her aunt Lucia Amenta, aunt and uncle, Tina and Antonio Farina of Wethersfield, their son Michael Farina and his children Nicole, Jonathan and Ashley, cousin Angela and her husband Dean Taylor of Hebron, and their children Cassidy, Mia and Phoebe, aunt Nicoletta Gulino of Canicattini Bagni, Italy, aunt and uncle Concetta and Andrea Chiaramonte, of Canicattini Bagni, Italy and many other cousins, including Paul Cavaliere of Florida. The family would like to thank the nurses and doctors of the Helen and Harry Gray Cancer Center at Hartford Hospital for the care and compassion they provided Lucia, especially Becky. We would also like to thank Lucia's "Sunday Brunch Club", Lis-el, Wanda, Lyn and Rosie, and the rest of the girls; Leslie and Nicole and the staff at Sharon Center School for all of the support and love they've showed Lucia. A very special thanks to Rita, Marisa and Emily, lifelong friends of Lucia, who showed her the true meaning of unconditional love. Funeral services will be Thursday at 9 a.m. from the D'Esopo Funeral Chapel, 277 Folly Brook Blvd., Wethersfield, followed by a Mass of Christian Burial at 10 a.m. at St. Luke Church, 66 Bolton Street, Hartford. The burial will be in Cedar Hill Cemetery, Hartford. Calling hours are Wednesday from 4-7 p.m. at the funeral chapel.